One of the most lasting of my childhood memories was going to the supermarket with my Grandmother to get some bread. This doesn’t really sound that out or the ordinary, hardly anything to make it a lasting memory, almost banal in fact. What was different about this occasion though was that there was also a journalist and photographer from the local newspaper with us. It was as the shop was shutting for the day and we didn’t go in through the front doors, we went around to the loading bays at the back where my Grandmother was pointing and gesticulating towards the two empty skips that the staff were slowly filling with waste food. Bread, milk, cheese and vegetables were just the start of it. Pretty much every food type you could imagine was being thrown out for landfill. My Grandmother went on at the journalist about how each day during the week there would be an entire skip full of food taken away to be buried, and how at the end of the Saturday (this was before supermarkets opened on Sundays) they would fill two skips. It wasn’t that the food had gone bad, it was just that it had passed its arbitrary best before date. Often as a result of just not looking as “nice” as customers were told they wanted, or just as often because the supermarket wanted to ensure it always had full shelves and so ordered in far more food than it knew it could sell. At that time my Grandmother ran the local soup kitchen. If you don’t know what a soup kitchen was, imagine a food bank where everything was already cooked for you and you could sit down and have what was probably your only hot meal that day, often your only meal at all. For the previous couple of years she’d approached the supermarkets asking if the soup kitchen could have the food, if they could take it away and use it to feed people. Of course, the supermarkets said no. Every single supermarket in the city refused to allow the soup kitchen to stop its waste going to waste. It took this trip with the local paper, and the subsequent front page article that they wrote, to shame the supermarkets into giving their bread away to a very good cause. I grew up with this ethos of waste-not want-not, which is why when I started Beer Nouveau our first brewery was built from reclaimed materials. The benches were all made from broken pallets, the kit from single-use eco-kegs. We’ve always tried to keep this mindset, reclaim, reuse, recycle, and create as little waste as possible. All our spent grain goes to a local farmer to feed his cows, our spent hops go to local allotment growers for mulch for their compost bins. And we’ve tried to bring this with us into our new brewery tap. Our new bar, like our original brewery, is made from old pallets and an old garage roof panel, our new tables are again made from pallets, and the chairs were rescued from a skip when a local university was redecorating. There is not a single thing wrong with any of these things that we’ve rescued from landfill that a few hours of hard work hasn’t been able to fix. So given this history of ours, it is somehow fitting that we invited the Real Junk Food Project to provide the food at our next brewery tap. These people are amazing. Seriously, truly amazing. Like my Grandmother many years before, they rescue what would otherwise be waste food and turn it into seriously tasty meals. Their pop-up restaurant nights have shown that “waste food” can be restaurant quality. Their head chef Mary-Ellen McTague worked with Heston Blumenthal at the 3 Michelin Star restaurant The Fat Duck before going on to run the highly popular Aumbry in Prestwich. We’re talking talent here. And what’s more, they operate the entire thing on a “Pay As You Feel” basis, there’s no set prices, you pay what you think the food is worth. Apparently the most asked question they have is “how much do you think I should pay?” to which the answer has always been, “It’s what *you* think you should pay”. And what, to us at least, is amazing, is they accepted! On the Saturday of our Spring Bank Holiday Brewery Tap, The Real Junk Food Project will be doing a pop-up event, providing you thirsty drinkers with what will certainly be amazing food to line your stomachs! 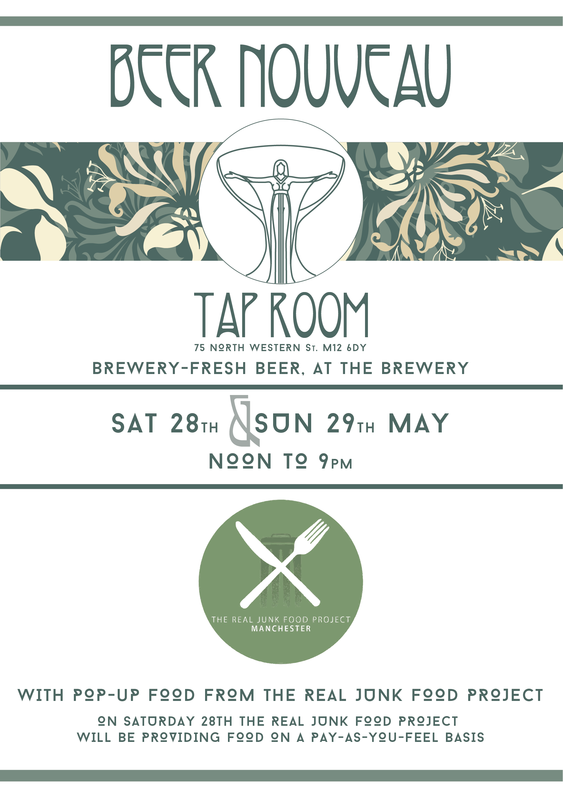 So come down, drink brewery-fresh beer and eat great food. 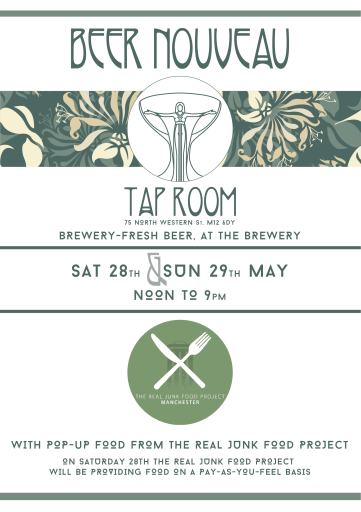 Our collaboration doesn’t end with the Brewery Tap though: we will shortly be starting experimental brews together. We’re aiming to produce a beer that is made purely from what would otherwise be waste food, no purchased ingredients at all. We’re looking to kvas, the Lithuanian drink made from bread, for this and our first test brew will be this week. We’ll be experimenting with different types of bread (Rye pale ale, Sourdough sour?) as well as flavouring with seasonal fruit and vegetables to bring you a range of drinks that we are hoping to use to raise funds for the Real Junk Food Project to help ensure they can keep doing their amazing work! So keep an eye on social media or pop along to one of their events to find out more!